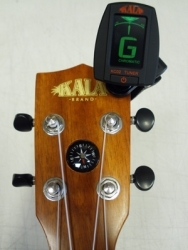 Mike passes this tuner around at workshops and even absolute beginners tune their instruments perfectly first time – despite the noise going on around them. He describes it as the best tuner he has ever used – by a country mile! chromatic* means you can tune any note (including sharps and flats) so it’s easy to experiment with other ukulele tunings or use on other instruments.